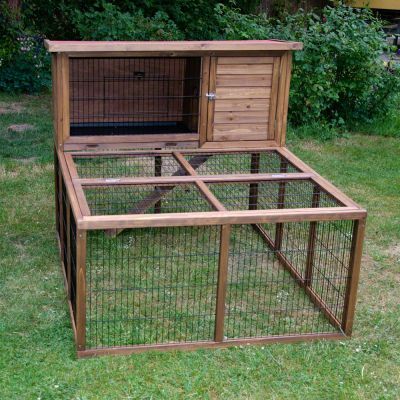 Rabbit Hutch Forest With Run is an outdoor home for pets that need lots of space to roam. It is made from premium timber. The hutch itself features a separate sleeping area and can be comfortably opened through a hatch in the mesh and a wooden door at the front. A lockable hatch with ramp gives your pet access to the outdoor run underneath and can be closed when you want your pet to stay inside. A removable plastic tray at the bottom of the hutch and the hinged roof make cleaning out quick and easy. The mesh roof of the run is hinged for access. Rabbit Hutch Forest With Run at a glance Overall external measurements (including run) L 152 x D 122 x H 117 cm External measurements hutch L 122 x W 52 x H 56 cm Measurements run L 152 x W 122 x H 61 cm Roof overhang 5/1 cm (front/back) Wooden door L 45 x W 38 cm Mesh door front L 40 x W 25 cm Tray L 68/72 x W 39/45 cm (inside/outside) Mesh size 2.6 cm Ramp width 14 cm Made from spruce Please note Without due care timber may dry out and become brittle warped or shabby. Please ensure your pet home is regularly cleaned and treated. We recommend treating dens and houses which will be used outside with wood care and impregnating products. Always make sure products used are suitable and harmless for pets. Placing the pet home in a sheltered spot will also help to reduce wear. Please note that this product is dispatched in more than one parcel. It is therefore possible that individual parcels will arrive on different days. Please note the dimensions given also include the roof and not only the body of the hutch. The Beaphar Care+ range is the first totally complete super premium food available for the small pet offering the highest possible quality and formulation known to man. The high quality proteins and Omega 3 and 6 fatty acids help to ensure that an animal will have a healthy and long life without experiencing the diseases caused by nutritional deficiencies. The foods also contain prebiotics and Yucca extracts and the chelated minerals improve absorption and supply to the body. Being developed in co-operation with veterinary surgeons dieticians and leading rodent experts this food has to be the very best available on the market today. Vital Apple Rabbit (1.5kg) is a high quality tasty feed for rabbits containing apple which your rabbit will find hard to resist. Fresh water should be available at all times with the food. Willow sticks for small animals. With 100% natural materials, the Happy Pet Willow Sticks are great for your small pet to gnaw and nibble. Keeps teeth neat.